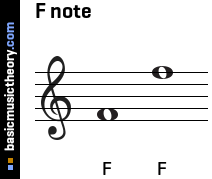 The Solution below shows the position of note F and F natural on the piano, treble clef and bass clef. This step shows note F on two octaves, on the piano, treble clef and bass clef. F is a white key on the piano. Note F natural is exactly the same as note F.
It is called natural when an accidental instance of that note has already been indicated on the key signature or on the staff, (eg. F# or Fb), and that accidental needs to be cancelled, so the sharp or flat is not needed for the current note. This step shows note F in two different positions on the piano, and describes the note characteristics. 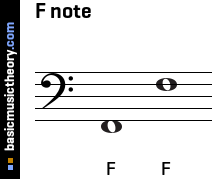 The next note up from F is F# / Gb. 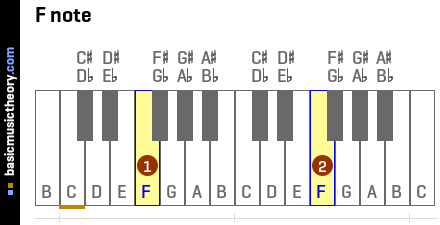 Or put another way, F# / Gb is 1 half-tone / semitone higher than F.
The next note down from F is E.
Or put another way, E is 1 half-tone / semitone lower than F.
There are no black keys between F and E.
3. Note F is found in which scales ? This step shows which scales note F occurs in, including the scale degree (ie. position / scale note number) of that scale. Note F is found in which scales ?